A huge NASA rover streaking toward Mars to investigate the Red Planet's potential to host life has picked up a new mission objective — help save the space agency's planetary science program. In the Obama Administration's budget request for next year, which was unveiled last month, NASA planetary science suffered a 21 percent cut, compelling the agency to scale back its robotic exploration efforts and drop out of two future European-led Mars missions entirely. But top NASA officials are holding out hope that some funding may be restored in the future if the 1-ton Curiosity rover, which is due to arrive at the Red Planet this August, lands safely and performs as advertised. The White House's budget request for fiscal year 2013 keeps NASA funding relatively flat at $17.7 billion. But it cuts planetary science funding from $1.5 billion to $1.2 billion, with further reductions expected in the coming years. NASA's venerable Mars program — which has had a string of successes recently, including the Phoenix lander and the twin rovers Spirit and Opportunity — takes a particularly hard hit. Its funding drops from $587 million this year to $360 million in 2013, then falls to just $189 million in 2015. The cuts have forced NASA to temporarily shelve plans for future multibillion-dollar "flagship" planetary missions. That's a departure for the space agency, which has launched roughly one of these ambitious, expensive efforts per decade, including Curiosity last year and the Cassini mission to the Saturn system in 1997. The proposed budget cut also compels NASA to drop out of the European-led ExoMars missions, which aim to launch an orbiter and a drill-toting rover toward the Red Planet in 2016 and 2018, respectively. These two missions are viewed as key steps toward an eventual Mars sample-return effort, a high-priority NASA flagship that is not feasible in the current fiscal environment. In the meantime, NASA officials are reformulating and downscaling their Mars efforts. They're hoping to launch a less expensive "medium-class" mission to Mars in 2018 to help keep the program vital, and to take advantage of favorable orbital dynamics between Mars and Earth at that time. "Losing 21 percent of the budget is very difficult," Green said. "We're developing a strategy to try to recapture some element of our program later on in the decade." The Curiosity rover touches down on the Martian surface in this artist's rendition. But Green and other NASA officials are not resigned to a permanently hobbled planetary science program. They think some funding could come back if Curiosity reminds the nation — and lawmakers — just what NASA robotic exploration can do. 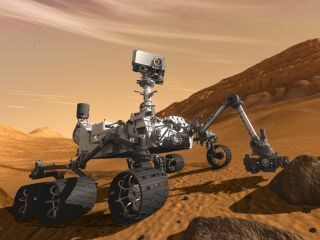 Curiosity is the centerpiece of NASA's $2.5 billion Mars Science Laboratory (MSL) mission, which launched in November 2011 and is due to touch down at the Red Planet's Gale Crater in early August 2012. Its chief aim is to assess whether the Gale Crater area can, or ever could, support microbial life. NASA is expecting big things from the rover. "I think when we set down in Gale Crater, it's going to be an explosion of science," John Grunsfeld, NASA's associate administrator for science, said at LPSC Monday. "It's going to be incredibly exciting." Grunsfeld and Green voiced hope that this excitement would extend beyond scientists, reaching the American public and the politicians who hold NASA's purse strings. They urged the researchers present at the conference to help make this happen, by using any means at their disposal to generate interest in Curiosity's landing on the night of Aug. 5. That landing will be incredibly dramatic. In a maneuver that has never been tried before, a rocket-powered sky crane will lower the massive rover down to the Martian surface on cables, with cameras rolling all the while. "This is just a seminal event," Green said. "We should not let this opportunity go by without relaying it to our stakeholders, and that gets right down to the general public." Grunsfeld agreed, saying Curiosity's landing and science campaign on Mars could help galvanize support for NASA's entire planetary science program. "I think the way to recover the program is to have a much broader community understand the value, and we have a huge opportunity with MSL landing — where there'll be a lot of visibility, some real discoveries, some really interesting discoveries — to talk about the exciting work that leverages the science," Grunsfeld said.